There are 4 posts filed in Safety Sidekick (this is page 1 of 1). We are sorry to announce that the functionality of SafetySidekick.com has been lost due to changes made by Google, the search engine we were using. Options are currently being evaluated. We intend to reintroduce SafetySidekick.com later this year. Thanks for your understanding. 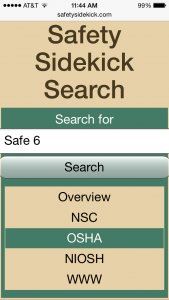 Have you given SafetySidekick Search a try? Click “Search” and a page with the results will appear. Review and click through to get more information. You can even request additional search results. Safety Sidekick Search helps you avoid all the ads and clutter. “SafetySidekick.com” is just one of the efforts we’re undertaking to promote a Safely Working Environment. Give it a try! 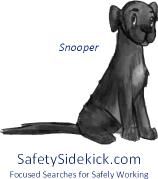 Snooper (Safety Sidekick) is Mobile!! Snooper (SafetySidekick 2.0) is mobile. Further optimization for mobile devices has been completed. Select a search of OSHA, NIOSH, National Safety Council, World Wide Web or all of them. Save the link to your device for quick access. SafetySidekick is just one of the efforts The Safely Working Project is supporting to facilitate a Safely Working Environment.